Are you looking to sell your home in the Northern Virginia area? Proper marketing of your real estate property can mean the difference between securing a quick sale and spending months on the market. 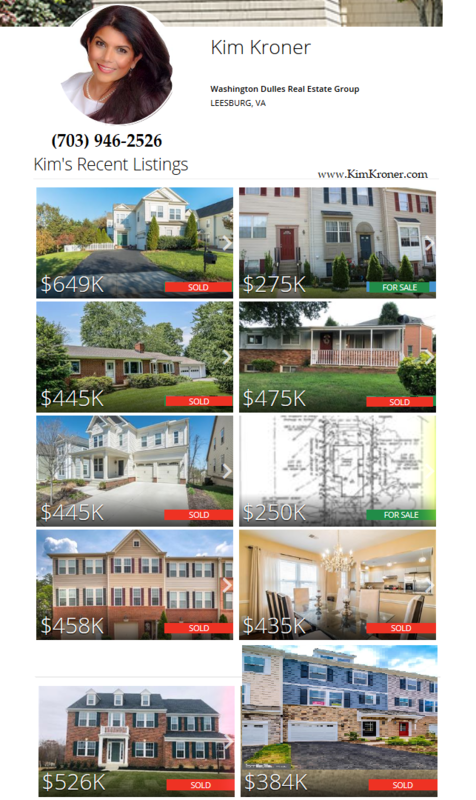 At Kim Kroner's Real Estate Group, our experience in marketing real estate in this area is unsurpassed. We have the tools and expertise to maximize your listing's exposure to potential buyers. Put our expertise to work for you! As an experienced professional who has helped many Northern Virginia and Maryland residents sell their homes, I know how to handle every aspect of the sales process - from strategically marketing and showcasing your home to making sure everything's signed, sealed and delivered by the closing date. Are you looking to sell your home in the Northern Virginia area? Proper marketing of your real estate property can mean the difference between securing a quick sale and spending months on the market. At Washington Dulles Real Estate Group, our experience in marketing real estate in this area is unsurpassed. We have the tools and expertise to maximize your listing's exposure to potential buyers. Put our expertise to work for you!